Checking the freezer upon my return from our family overseas trip, I found I still had a few packets of frozen sambal tumis from previous cooking, fish steaks, glass prawns and squid. Sam P. had also given me a tray of eggs before we left for Phuket. What can I cook to clear these “backlog” of food? Hmmm… Nasi Lemak? It does go well with sambal tumis and I only needed to spend minimally buying coconut milk, cucumber and pandan leaves (the supermarket ran out of banana leaves), since the rest of the other spices and condiments required were found in the fridge’s vegetable compartment. Nasi lemak it is! It’s been a long time since I made nasi lemak the traditional way (steamed instead of cooking in an electric rice cooker) as the process is quite tedious but the result is always gratifying! 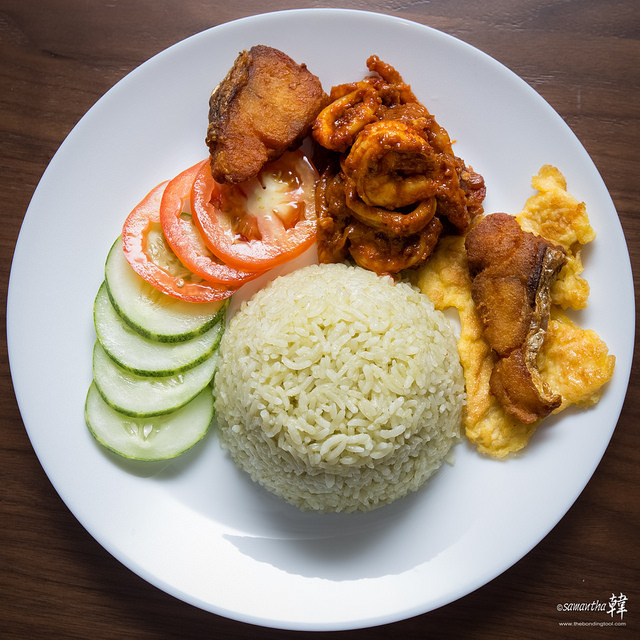 The rice is guaranteed to be delicious even when eaten on its own; tender and fluffy, possessing a subtle yet ambrosial “back of mouth” rich flavours from the coconut and not forgetting the slight floral, sweet citrusy undertone from the ginger and lemongrass. This time, I have infused the rice with pandan flavour making it even more alluring. Aromatic Pandan Flavoured Nasi Lemak! 3 cups Long Grain Rice, rinsed till water runs clear and soaked for 4 hours (my one cup is 140g). 6 Pandan Leaves, divided into two portions and tie into knots. ½ Red Onion (or 2 big shallots), sliced thinly. 3 stalks Lemongrass, white bottom part only, bashed to release essential oils. 3 cloves Garlic, bashed lightly. ½ Red Onion, sliced thinly. 1 teaspoon Sea Salt, slight mound. Banana Leaf, optional but will heighten taste profile. 20 Pandan Leaves, cut into small pieces. Blend above in a food processor and squeeze out the juice over a sieve twice to remove any dregs. 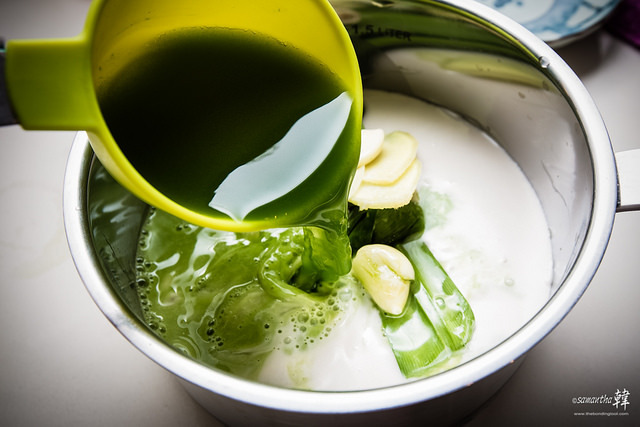 Pour juice into a measuring cup and top with more water if necessary to make 1 cup (250ml) pandan water. 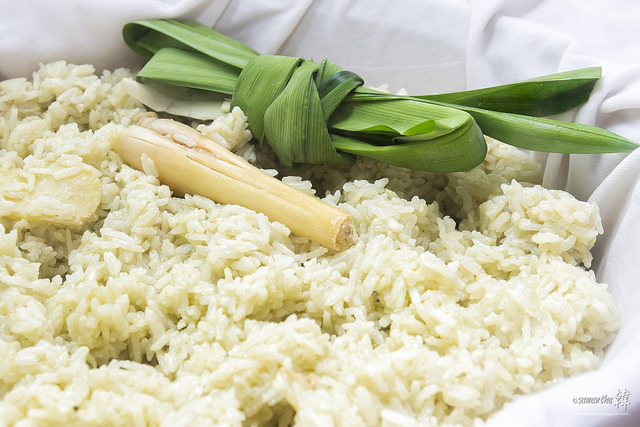 If you do not want pandan-flavoured rice, just use 1 cup plain water. You can also substitute the pandan juice for 1 tablespoon of fresh turmeric juice (plus a pinch of turmeric powder) and add water to make up the 1 cup water, if you prefer yellow rice (nasi lemak kunyit). P.S. If you like stronger hues, you may add a drop or two of food colouring to the rice. I did not use any here. 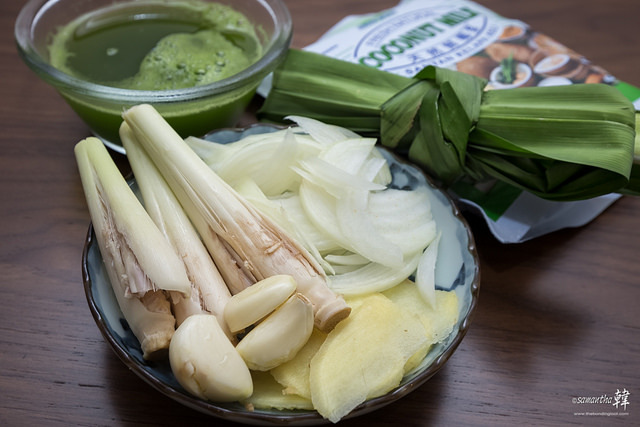 From left to right clockwise: Extracted pandan juice, pasteurised coconut milk, pandan leaves, onions (I prefer red onions but had half an already cut yellow onion in fridge so I used it), old ginger slices, garlic and lemongrass (always bashed to release the essential oils). don’t have a steaming rice basket so I lined my steamer with cloth. 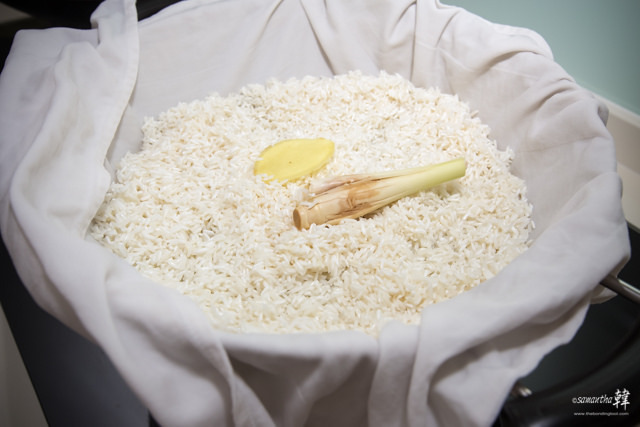 Drain soaked rice and place them on the cloth with a slice of ginger and one lemongrass. Make steam holes in the rice and steam (covered) on high heat for 30 minutes. Prepare this 15 minutes into the rice being steamed. 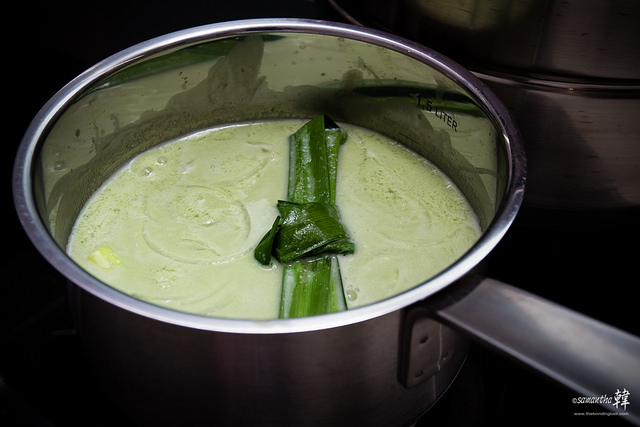 In a saucepan, pour in the coconut milk, add garlic, lemongrass, ginger, pandan juice (and water made up to 1 cup in total), salt and knotted pandan into the pot. Simmer on low heat for 15 minutes. If using food colouring, add to this after the heat has been turned off. I did not use food colouring. 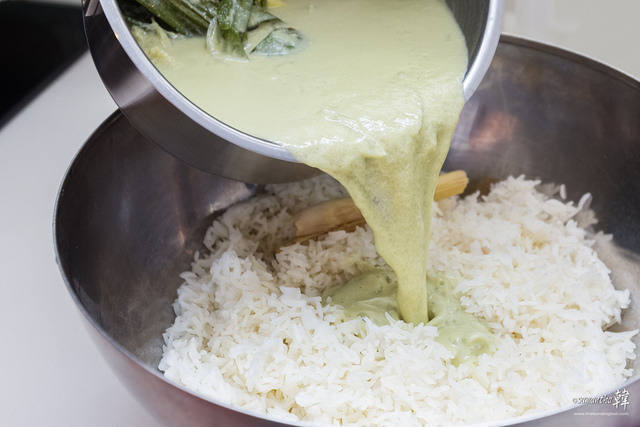 After 30 minutes of steaming, remove rice from steamer and place them into a huge bowl/pot and pour in the pandan-infused coconut milk into the rice. Set aside till the liquid is absorbed into the rice about 10 minutes. Keep the steamer simmering on low heat to keep warm (you may check the water level and refill with more hot water as we still have another round of steaming to do). 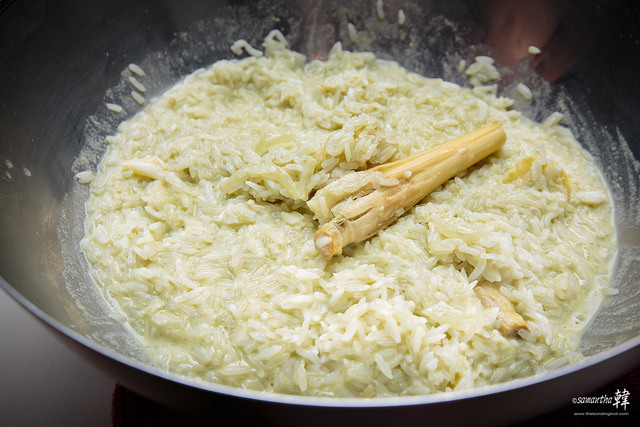 When the pandan-coconut liquid has been fully absorbed by the rice, fluff them with a pair of chopsticks gently so as not to break the grains and transfer the rice back onto the cloth in the steamer. Put in the second bundle of knotted pandan leaves and a few strips of banana leaves if using. Make a few steam holes in rice (see image). Cover with lid and continue to steam on high heat for another 25-30 minutes or until rice is dry and tender. I have here some cucumber and tomato slices, prawn and squid cooked in sambal tumis, fried fish (marinated with sea salt and turmeric powder) and omelette (seasoned lightly with sea salt and white pepper powder). I would have placed a small oblong piece of banana leaf on the dish before plating all the food for more fragrance and visual appeal. 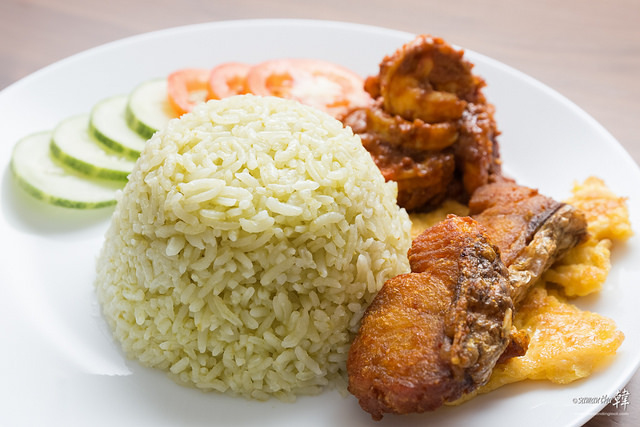 In Malay language, Nasi means rice, Lemak means rich (usually associated with cream) in taste, and Kukus means steam, so Nasi Lemak Kukus in this case means Steamed Coconut Rice. I can taste and smell that dish already. Filipinos love pandan flavor very much…. it’s used in ice cream , chicken, and cakes.